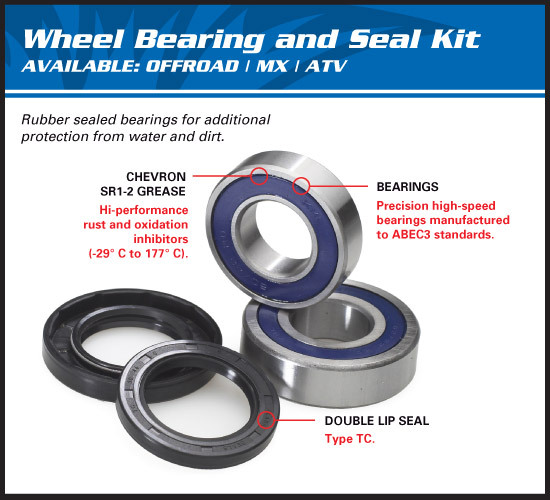 All Balls Racing Wheel Bearings feature High-Speed bearings that are manufactured to ABEC 3 precision levels, triple lip rubber seals that keep the grease in and the water and dirt out all while utilising a Chevron SRI 2 grease that contains rust and oxidation inhibitors. Check the bore to make certain it is clean and the axle easily passes through it. Check each end for wear and burrs. The edges must be square to seat properly against the new bearings. If the old bearings failed it is a good idea to confirm that the centre spacer has not been damaged. Make sure the inner space is the same length or slightly longer than the bearing stops in the hub or carrier. Clean the hub, removing any dirt and corrosion. Make certain not to remove metal. This will adversely affect bearing fit. Clean the outer wheel spacers and inspect them for wear on either end as well as wear on the outer surface where it makes contact with the seal. If the spacers are excessively worn they should be replaced.